An ergonomic flush cutter that is especially designed for cutting cable ties close to the head and making them safer to handle by preventing harmful spikes and has been introduced by Xuron Corp. of Saco, Maine. The Xuron® Model 2275 Cable Tie Cutter provides full cutting access along the entire length of their blades for unrestricted cutting surfaces and fast operation. Especially designed to leave smooth flat ends when cutting cable ties, it uses Micro-Shear® bypass cutting action rather than compression cutting which often produces sharp spikes that can create a potential hazard. 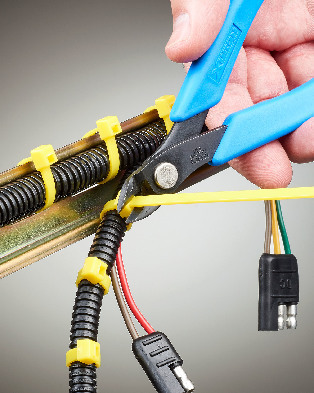 Comfortable to hold in either hand to quickly and cleanly cut cable ties up to 7 mm W, soft plastics, and wire up to 2 mm W the Xuron® Model 2275 Cable Tie Cutter features soft Xuro-Rubber™ hand grips, a Light-Touch™ return spring, and no cumbersome finger loops. In addition to wire harness making and assembly, other cable tie applications include totes, signage, and general repair. A complete catalog is available on request.